In 12 days participant of the expedition had an opportunity to closely study the region, starting from the oldest national park in Central Asia – Aksu-Zhabagyly. The territory of the park is 131 934 ha (326 acres). Here you may explore rare species and more than 170 types of plants. Here in the national park visitors can take several tours including ecological for nature lovers and educational tour for children and students. One of the most popular spot at the park is the canyon – Aksu, which used to be a settlement in ancient time, and this can be proved by the mysterious stone pictures. The depth of the canyon is about 1800 meters. The travelers made a stop at Sairamsu Lake, which is located at an altitude of 2350 meters. Sairam-Ugam National Park is located in the northeast part of the Tyan-Shyan Mountains. The lake is considered to be originating from the mountains’ glaciation, since its water drains into the lake via underground springs. Besides this, travelers could see remains of another ancient city Sauran, which was also located on the way of the Great Silk Road. Today the regional administration puts all efforts to preserve and promote the beautiful landscapes that are very attractive to tourists. Therefore, the local administration created the concept of “Ancient Turkistan”, where the approaches for the development of tourism, construction of new buildings and reconstruction of old streets are included. 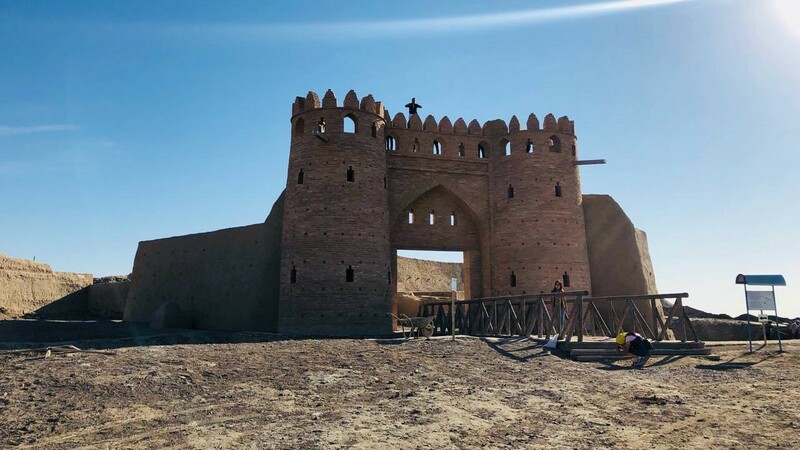 “The New Silk Road” route turned into the most intense one, since in a short time travelers had to explore so many places starting from Zharkent city and ending with the ancient city settlement Otyrar. The route took travelers through counties Khorgos and Saty, Kolsai lakes in the high mountains, Kaiyndy lake, Sharyn national park, Temirlik canyons, “Valley of castles”, national state park Altyn-Emel, Aktau mountains, Singing sand dune, an ancient settlement Talkhis, Tanbaly tract, Akyrtas archeological complex, and mausoleums of Karakhan and Aisha-bibi.Otyrar city was final destination of the tour project “Travelling to the land of the Great steppe” (Uly dala eline sayakhat). 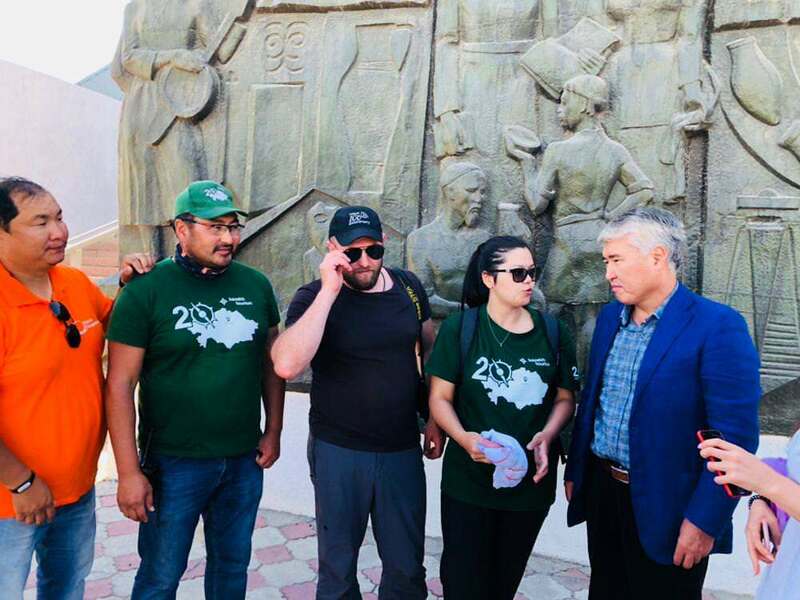 The minister of culture and sport of Republic of Kazkahstan Arystan Makhmediuly greeted the participants of the project at the end of the trip. “I am glad to greet and deliver my congratulations with the end of the largest route of the project “Uly dala eline sayakhat”.It has been amazing but yet challenging trip, which you guys took with a great courage. This expedition has great value in developing tourism in Kazakhstan. Traveling throughout Kazakhstan, discovering every corner of our large country past three months you have explored so many incredible and magnificent places. Indeed the results of your expedition demonstrate that we have plenty of places that are fascinating and historically important. All we need is continuing working in this direction, bringing the inner tourism to the new level, preserving for the next generation, and presenting this legacy to the foreign tourists,” stated Arystan Mukhamediuly. It needs to be said, that on the way back the participants will be exploring popular places of Shymkent city and visiting the famous Akmeshit cave, which is 90 km (60 miles) away from Shymkent. The edges inside of the limestone cave remind a dome of the nomad’s house (yurt). In general, the participants of the travel project walked thousands of kilometers. At each sequence of the route, they have taken plenty of pictures and videos. Based on this collection special photo-video bank, as well as new guides and routes for tourists will be created. The expedition “Traveling to the land of the Great steppe” was organized in the framework of the celebration the 20th anniversary of Astana. The sponsor of the project is “Kazak tourism” National Company commissioned by the Committee of the tourism industry of the Ministry of Culture and Sports. The Republican public association “QazaqGeography” implemented the route “The New Silk Road”. The expedition team consisted of experienced travelers, representatives of tour agencies, bloggers from Kazakhstan and other countries, as well as the travel crew of “National Geographic Russia”. Otyrar settlement — is the ancient site under the sky protected by UNESCO. Visitors can see the ruins of the ancient palace, mosques, and houses demonstrating the scale and vitality of the city. The mausoleum of venerated Sifu Arystan-Baba is located not far from Otrar. This mausoleum is one of the most visited places in the South region of Kazakhstan. Every day pilgrims from all around the country and tourists come here to see this historical legacy. The mausoleum is under state protection since 1982. The infrastructure of the area of tourism is quite organized. Tourists can easily find hotels, marketplaces, rest areas, and restaurants. On the top of that, local people are ready to assist visitors showing them must-see places, arranging accommodations and meal. Near to the ancient settlement another 1500-year-old historical city is located. This year Turkistan city became the center of its region. The main sight of the ancient city is the mausoleum of Khoja Ahmet Yassawi, built by the request of Tamerlane the Great. The mausoleum is considered as the sacred place for Turk nations. Besides the mausoleum, there are also many other historical buildings and tombs of Kazakh khans and nobles.